Jitter and Latency are two terms that often get bandied about together, but are actually two distinctly different things. In a nutshell, latency is a term used to outline the amount of time it takes for a packet to transfer to its destination. In contrast, jitter is the delay that varies over time when the signal wanes or jitters. In this article, we’re going to look at what the difference between these two is in further depth. 8 Jitter vs Latency: Avoid Both! As mentioned above, network jitter is the term used to refer to variation in latency of packet flow from endpoint to endpoint. Jitter is measured in milliseconds and can be devastating to real-time services such as video calls and VoIP calls. However, the user is unlikely to notice jitter when completing downloads as data doesn’t need to be delivered in real-time the same way that audio or video signals do. Latency measures the time it takes for data to travel from its source to its destination across the network. Typically administrators measure latency as a round-trip (with round-trip time), the time it takes for a packet to travel to its destination and back to the source. 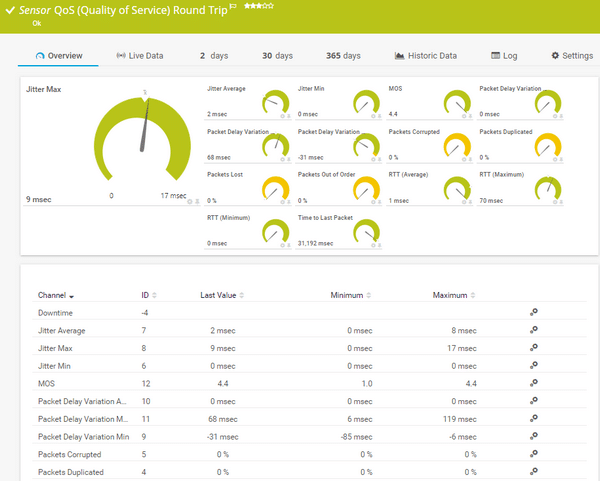 A high round-trip delay indicates that the network is not performing at its best. Latency is effectively a measurement of delay. Now that you know what jitter is, we’re going to take a look at how you can monitor for it on your network. If you’re at the stage where you’re not sure if network jitter is a problem, then you’re going to need a network monitoring tool that can measure jitter. This way, you’ll be able to see how bad the problem is before deciding on a course of action to address it. Each of these sensors has its own unique display that you can view to see the metrics live. This helps to pinpoint when jitter is a problem on your network. It is vital that you diagnose jitter on your network before implementing QoS configurations. This way you can make sure that jitter is a problem before implementing any complex configuration changes. PRTG is available to download for a 30-day free trial. For monitoring latency, there are a number of different tools you can use. In this section, we’re going to look at SolarWinds Network Performance Monitor and Paessler PRTG Network Monitor. Each of these products is great for monitoring the development of latency on your network to make sure that your service stays top notch. Before we get to these products themselves, we’re going to look at the difference between one-time latency tests, and ongoing latency monitoring. When monitoring for latency you don’t necessarily need to monitor your network on a long-term basis in order to diagnose that there is a problem. In many cases, you can receive the same result by conducting a one-time test of latency. For instance, if you run a ping query you can measure the response time to assess how much latency occurs across the network. This approach allows you to find out if latency is a problem at the time you take the test. However, if you want to compare how latency changes over time, or make sure that latency isn’t a problem in the future then you’re going to want to implement some form of ongoing latency monitoring. Ongoing latency monitoring, or perpetual latency monitoring as Paessler refers to it, is an approach where you monitor your latency on a long-term basis. Essentially you monitor your network to see how its latency, packet loss, mean opinion score, and jitter change over time. This approach is effective because it allows you to keep tabs on latency without having to endlessly run ping tests. For instance, platforms like PRTG Network Monitor can send you alerts once latency is detected. Structuring your monitoring environment with ongoing latency monitoring allows you to respond the moment latency occurs rather than the moment you discover it. 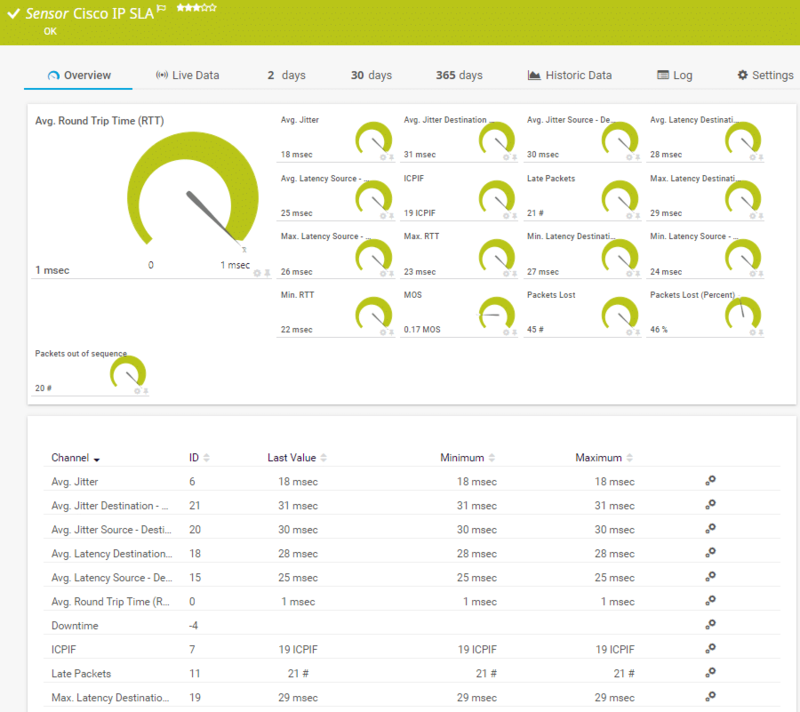 With SolarWinds Network Performance Monitor you can troubleshoot for network path latency and slow application performance. This tool uses deep packet analysis to determine how much latency packets are facing on your network. In the event that latency is found to be a problem, you can also pinpoint the source of the problem. In many cases, this will be some form of performance issue. 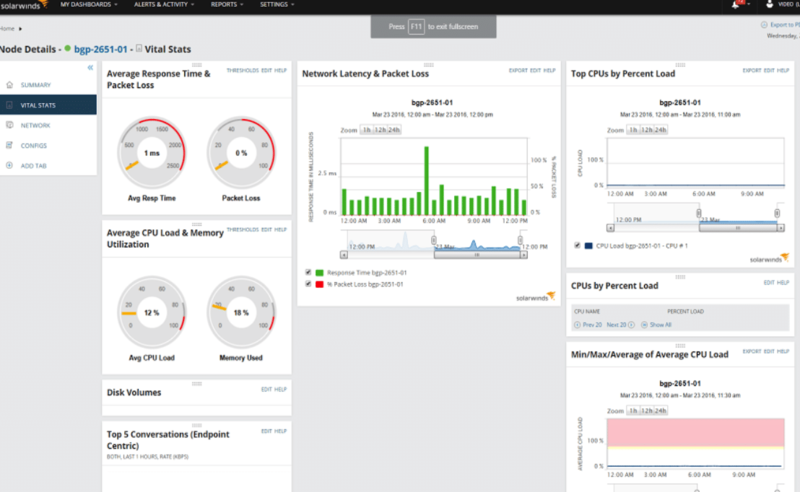 SolarWinds Network Performance Monitor has its own packet analyzer that can identify over 1,200 applications. This allows the program to determine whether the latency has been caused by the network or by a problem with the application. Having this information on hand greatly reduces the amount of work you have to do when running troubleshooting and addressing the problem. It is available for download on a 30-day free trial. The QoS Round-Trip Sensor, in particular, is very useful because it allows you to measure packet delay variation, jitter, mean opinion score, corrupted packets, duplicated packets, lost packets, packets out of sequence, round-trip time, and time to last packets. This information allows you to quantify how latency is a problem within your network. What makes PRTG Network Monitor ideal for latency monitoring is its use of alerts. You can receive alerts whenever latency crosses a predefined threshold. This means that you don’t have to be at the desk when latency spikes in order to catch it. The sooner you know that latency is a problem the sooner you can implement a plan to stamp it out and keep your service performing at its best. PRTG can be downloaded for a 30-day free trial. However, one of the most common causes of network jitter is packet queuing. As a basic rule the more packets that are being routed across your network at once, the more performance issues you will encounter. As you can see there is a diverse range of factors that can lead to latency throughout the network. When a packet queue occurs there will be a bottleneck at one point in your network. 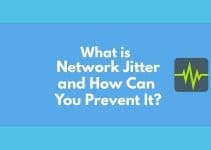 There are a number of different ways you can fix network jitter depending on the cause of the problem. However, it is important to recognize that network jitter isn’t always within your direct control. Even the best hardware in the world won’t prevent jitter if the internet service you receive isn’t performing well. That being said, there are still a number of fixes that are completely within your power to stop jitter from killing your service. Upgrading your internet is one of the most direct ways you can fight off network jitter. As a general rule of thumb, you want to make sure that you have the upload and download speeds to be able to support high-quality VoIP calls. The connection speeds you require depend on how many VoIP calls that you want to run. For instance, an office with 10 concurrent calls will need substantially fewer internet resources than an office that needs to support 200 concurrent calls. A good rule of thumb is that you can support 12 calls for every 1 Mbps of bandwidth. This is just the tip of the iceberg in terms of factors you should take into account to have the best end call performance, but it gives you an idea of how much of your resources need to be delegated to the internet. Many organizations have begun to deploy jitter buffers to respond to jitter. A jitter buffer is a component situated within endpoints that get around jitter by receiving packets and holding on to them for a set amount of time before passing them on. This buffer period ensures that packets are transmitted in sequence. This alleviates the problem where jitter causes packets to arrive out of sequence. One of the key problems with network jitter is that latency fluctuates and packets reach the end user out of sequence. By holding back the packets for a short time period the jitter buffer can ensure that everything arrives in sequence. In a VoIP or video call, this would ensure that the end user can understand what’s being said. The only issue with jitter buffers is that you tradeoff jitter but increase latency. A jitter buffer deliberately increases latency in an attempt to make sure that the packets arrive in sequence. The end user may be able to understand what’s being said but it will still be delivered late. While jitter buffers are a good short-term solution, they are a band-aid over the larger solution. Finally, you can stave off network jitter by upgrading your network hardware. Upgrading the infrastructure that holds up your network can have a remarkable difference in the network performance. This is even truer if you’re currently operating on a network with lots of outdated hardware. Though this isn’t a fix-all solution, it can make a notable difference within older networks. When upgrading your hardware it is a good idea to pay special attention to components like routers which form the foundation of your network performance. Paying the extra money for a high-quality router with extensive QoS configurations can help you to transform your network performance overnight. Latency can be a very complex problem to address. The important thing to realise is that a lot of latency comes down to how long packets are in transit. So network latency is based not only on your internet service but also how well optimized your current equipment is. There are many instances where rogue endpoints will be eating through your network bandwidth. These devices are often referred to as top talkers, and high bandwidth consumption can indicate breach or performance concerns. Poor connection in an area can also indicate that you need to improve signal distribution in the area. As a consequence, you’ll want to use tools like SolarWinds Network Performance Monitor and Paessler PRTG Network Monitor to point to endpoints that are experiencing performance issues. If you find that latency is worse for some applications and endpoints in your office then you can use a tool like SolarWinds Network Performance Monitor to generate a heat map and see where your wifi signal is weakest. This will give you a frame of reference to improve your current network connection. The important thing to remember is that there are many ways to look for problematic devices and endpoints with network monitoring tools. Another key threat to the free flow of traffic in your network is that of bottlenecks. Bottlenecks are areas of high congestion where lots of traffic is fighting over a limited amount of network resources. 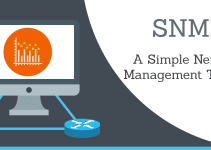 Monitoring your network traffic flow will allow you to point to bottlenecks occurring within your network. You can do this with PRTG Network Monitor to see if there are certain times of the day or certain areas of your network where bottlenecks occur. Once you’ve found a bottleneck there are many different things you can do. For instance, you can reroute traffic or upgrade your router. Your response should be dependent on the cause of the bottleneck. You’ll want to make sure you implement QoS monitoring so that you know exactly where these bottlenecks are. One particularly effective way to address network latency is to make use of a Content Delivery Network (CDN). A CDN uses content caching, connection optimization, and progressive image rendering to make use of your networking resources more efficiently. For example, content caching is where the CDN uses Points of Presence (POPs) to create copies of web pages before caching them and compressing them. This means that visitors to your site can access content with a lower round-trip time. Likewise, your connection is optimized via a number of different methods. One of the simplest is that CDN’s use a Tier 1 network to route traffic through as few hoops as possible. This ensures that the round-trip time is decreased and the end user enjoys a better user experience. 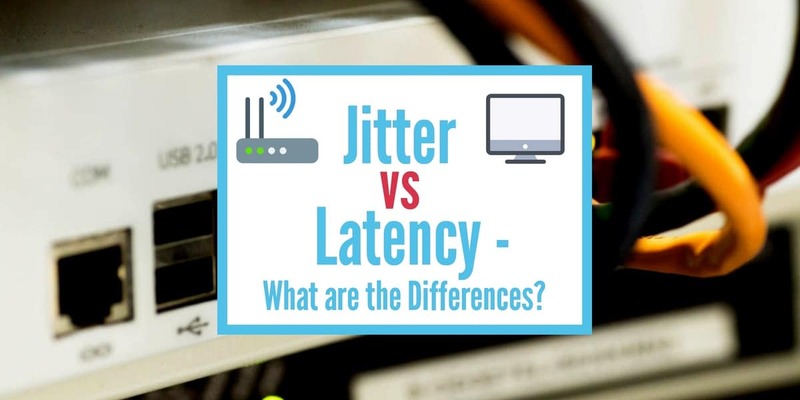 Jitter vs Latency: Avoid Both! While jitter and latency are closely tied together, they are very different in practice. Having a thorough understanding of each of these networking concepts will aid you greatly not just when it comes to detecting them, but also when it comes to implementing QoS configurations. If you’re running VoIP services or considering doing so in the near future then you want to take extra care to make sure that network jitter doesn’t become a problem. The only way to do this is to implement QoS monitoring. 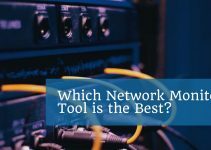 There are many different tools that support jitter and latency monitoring, but we recommend Paessler PRTG Network Monitor and SolarWinds Network Performance Monitor as the best products for this end. By keeping an eye out for the signs of latency and jitter before they occur you can ensure that once they start to emerge you can take action. At the end of the day, you want to make sure that the amount of jitter and latency present on your network stays as low as possible. Without implementing QoS monitoring you won’t be able to recognise when these have emerged until you experience live performance issues first hand.